Ah.. The spectacular couples of Hollywood and the glitz life. It feels like you never see such beautiful couples in every day life. Not that this is a reflection of the quality of the relationship.. many of the below are no more. Torn apart by forces that their seemingly perfect lives couldn't protect them from. However it is not my or any one else's job to analyse their couple productivity. Instead I prefer to simply admire :) Heres a list of some of the fiercest couples in pop culture history. 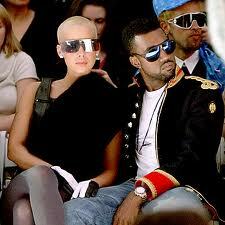 One : Amber Rose and Kanye West. Bouche as they are, these shades make them look like the King and Queen of the Futuristic Fashion movement. Three : Kim Kardashian and Reggie Bush. Definitely one of the hottest couples out there. A lot of which is down to the fact that Kim is one of the most coveted women on the planet! Four : Megan Fox and Brian Austin Green. My personal Favourite. I sometimes just type their names into google. :) I don't care people! I. Like. Pretty things!! There you have it. No couples were harmed in the making of this post :) Hope you like it I had fun making it.